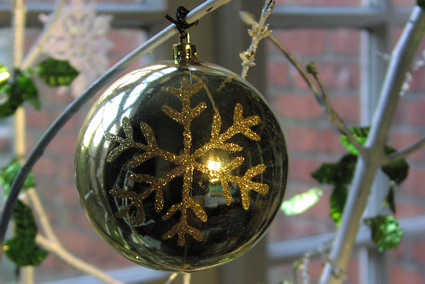 This year I have put up three Yule trees. 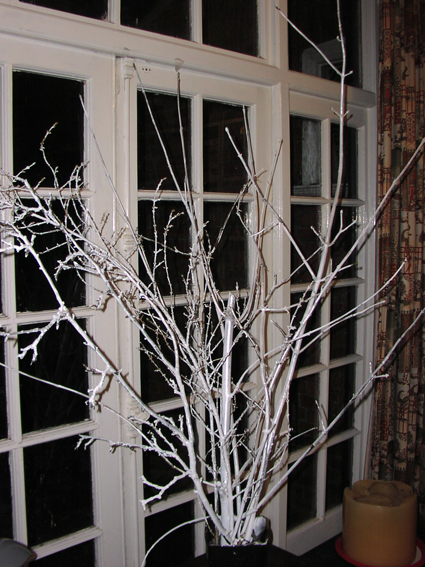 One was a traditional green tree decorated with shiny baubles, the second was a silver tinsel tree with pretty lights and the last is my upcycled twig tree, which you can see in the photos. When it comes to craft projects, I usually have more enthusiasm than ability, but I'm quite pleased with the way this one turned out. To start with, I collected a bunch of thin branches from my garden. Some were dead wood that had fallen in a storm and others were branches that really needed pruning anyway. Nevertheless, I was careful to ask permission from the tree spirits before using my loppers. Once I'd brought the wood inside, I was not convinced my project was likely to work out. I posted on facebook at the time: "I currently have a bunch of large sticks in the living room. They came from my garden and smell vaguely of fox wee and leaf mould. I hope some white paint, glitter and twinkly lights will turn them into an upcycled Yule tree, but I'm not totally sure I have necessary the degree of skill." Even when I had put the sticks in a re-used flower pot filled with pebbles - also from the garden - I half suspected my Yule tree would end up like something out of The Nightmare Before Christmas. But I persevered. 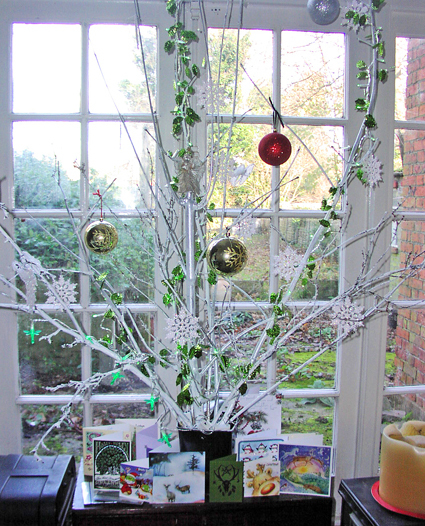 When the paint had dried, I decorated the twig tree with sparkly snowflakes, baubles, butterflies and a fairy in the middle. Finally, I added some strings of holly-shaped tinsel tree lights. Seeing as most of the decorations were reused from previous years and will be reused again in the future (unless of course the world ends on 21 December), the whole thing cost very little. I'm sure some people will point out that a Yule tree is traditionally meant to be an evergreen, not bits of dead wood, but recycling something old into something new is in its own way a symbol of rebirth suitable for the Winter Solstice. That's beautiful! And you're right - I think it is a perfect symbol - rebirth doesn't have to mean the same thing starting over again, and your tree is a great example of something beginning a new life! Oh that's really pretty and in a way much nicer than shop bought decorations. It pleases me when people use their creativity.